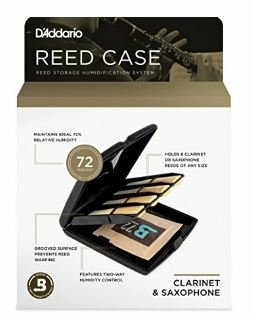 D'Addario's signature single reed case holds eight of any size clarinet or saxophone reeds, from Eb clarinet through baritone saxophone. Reeds are held snugly to a grooved surface, which prevents warping. The airtight gasket ensures a proper seal, which keeps reeds safe and stable when traveling. D'Addario's signature double reed case holds five oboe, oboe d'amore, English horn, or bassoon reeds in any combination. The airtight gasket ensures a proper seal, which keeps reeds safe and stable when traveling.